Ava was bred by Mr Kriwet in Bad Pyrmont near Hameln, Germany, a successful Trakehner breeder. On Mr Kriwet's death Ava was bought by Jutta Arens of Aerzen in 2009. 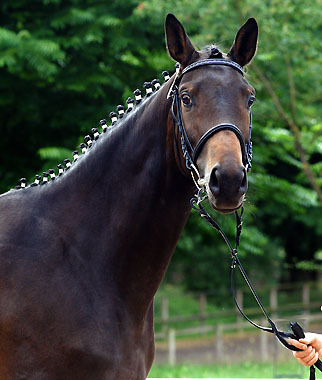 Ava is a Premium Mare and was performance tested in Germany with a score of 7.1 points. As a 5 year old Ava was put in foal to Amatcho and the following year had her first colt, Avalotta. In 2012 Ava was again put in foal, this time to Excusiv, and the following year produced another colt, Avatar. The following year, having been put in foal again, this time to Saint Cyr, Arensa was born.